The Beast, Car Donal Trump, US President's travels in! Donald Trump took the presidency in January 2017 and with him debuted the brand new state limousine for the safety of the new president of the United States. He had the lowest approval rating among all the presidents-elect in the USA, sparked controversy during the very first week in the White House, and drew nationwide protests. So, it makes sense Donald Trump’s Car should be something special that can safely get him everywhere. 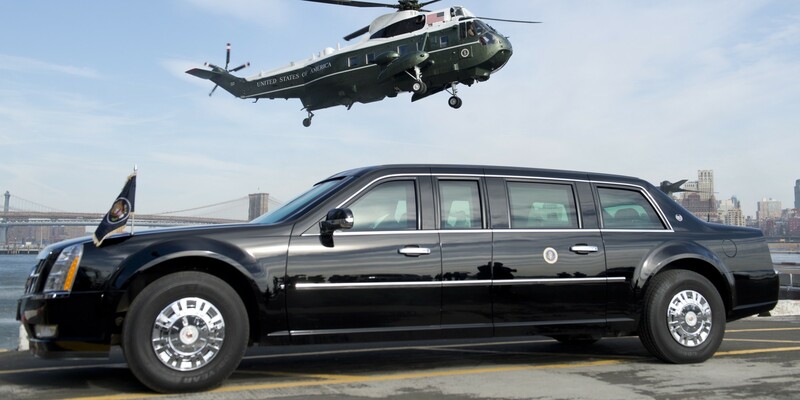 Designed from the ground up by the Secret Service, President’s $1.5 million “Cadillac One,” aka “The Beast,” is a moving fortress impenetrable by bullets and bombs. The president has 12 identical limos in a rotation and, when not in use, they’re parked in the basement of the Secret Service’s headquarters and are under 24-hour surveillance. 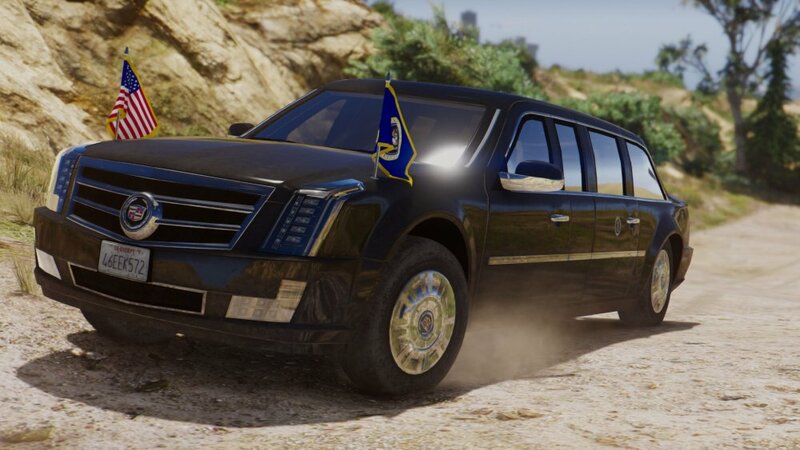 The current model of presidential state car is a unique Cadillac built upon a medium-duty truck platform. The car is equipped with many life-saving, offensive, and defensive measures, and is built to the United States Secret Service’s standards. When riding in the state car, the president is cut off from the outside world but has extensive 21st-century communications gear at hand. In a recent change, the vehicle bears standard Washington, D.C. license plates. The next generation of presidential state car is currently under development. At least two cars travel with the president wherever he goes, and they get a humble 3.7 miles to the gallon. The president’s motorcade is surrounded with up to 45 other armed vehicles, including an identical decoy, local police, a mobile communications centre, more armed vehicles, and an ambulance. -The president’s seat has a state-of-the-art satellite phone and a direct line to the vice-president and the Pentagon. -The glass partition can be lowered only by the president. -The car has a storage of the first family’s blood types. -It can run on flat tires as the tires reinforced with Kevlar. It is even designed to run on the bear wheel for a long distance when the tire comes out in case of an emergency. -There are two holes in the front bumper that can emit tear gas and fire smoke grenades. -There is an infrared video system for the driver to drive through smoke and night vision cameras for driving in darkness without lights. -The car has a standard steering wheel, but the dashboard contains a communications centre and GPS tracking system. The driver’s window can be lowered only 3 inches. The driver is trained by the Secret Service to escape and evade the enemy and perform a 180-degree ‘J-turn’. -The cars are manufactured by General Motors in Detroit and have a gasoline V8 engine. The top speed and weight of each car are classified, as is the bulletproof technology used in the windows. In fact, these can protect the riders against armour-piercing bullets and explosion with five layers of polycarbonate and glass. All the windows except for the driver’s one are completely sealed. You can roll down only the driver’s window just by three inches. The doors of the presidential state car have no keyholes; the way to open the passenger doors on the limousine is a secret known only to the Secret Service. It has more 5-inch (130 mm)-thick bulletproof glass than the previous model, and only the window at the driver’s seat opens It also has run-flat tires and an interior which is completely hermetically sealed to protect the occupants in the event of a chemical attack. In addition, the windshield can also hold up against a .44 magnum or armour-piercing bullets. The Most Secure Car on Planet Earth. It’s much more than a customized car. Decommissioned presidential state cars are dismantled and destroyed with the assistance of the Secret Service to prevent their secrets from being known to outside parties.